Spencer is the owner of Queen City Hoops, a Charlotte Hornets blog, formerly of the True Hoop Network. He’s also a co-host of the Buzz Beat podcast and a former high school basketball coach. And like I said, he’s also a big fan of the ‘Hoos. With the introduction out of the way, let’s dive right in. 1. As a UVA fan, two things. A) How worried were you during the 1st half vs. Gardner-Webb, and B) What’s your confidence level as the Sweet 16 approaches? Spencer Percy: Any Virginia fan that tells you they weren’t terrified during the first half against Gardner-Webb is lying. I was on the golf course — I knew I couldn’t sit through another Virginia 1-16 matchup — but watched the entire game later that night. Give Gardner-Webb a lot of credit; they weren’t intimidated, and are simply a solid team with dudes that can put the ball in the hoop (54.8 eFG%). I’ve gotten this question plenty over the past 48 hours. I’m very confident and that’s purely because I can tell Virginia, suddenly, is as well. Every sport is mental and anyone who believes that Virginia walked into that first game against Gardner-Webb without some elevated anxiety (including the coaches) is under the assumption that these guys in orange and navy aren’t human. They overcame that anxiety in the second half on Friday and then played their most complete defensive game in a long time against Oklahoma on Sunday (0.91 points per possession, 44 eFG%). That was Virginia basketball at its purest form under Tony Bennett, and they had a lot of fun doing it. At this point in the season, which fanbase doesn’t have some nerves? Even blue-blood fans with Duke, UNC and Kentucky must have some anxiety; the stakes, especially in a single-elimination tournament, are so high. Gardner-Webb came prepared for the first round matchup — spacing the floor and slipping ball screens for looks at the rim. It worked. And then, with about four or five minutes before halftime, Virginia started to adjust. After that, they took off. With Virginia this season, I always go back to the numbers and the personnel — both of which are elite. The Cavs rank No. 1 in KenPom’s adjusted efficiency margin, have lost just three times all season (twice to Zion-led Duke) and have several future NBA players on the roster. That’s a recipe for success. This team has also sharpened its sword by diversifying its scoring attack — with more high pick-and-roll from its continuity ball screen (CBS) offense. No team is perfect, but Virginia has an answer for almost everything. 2. How do you feel about the center rotation with Virginia this season, especially now as the team heads deeper into postseason play? SP: It’s typically nice to have options, but I think this has been the biggest stressor on Tony Bennett this season. All three of Jack Salt (experience and defensive toughness), Mamadi Diakite (raw athleticism, shot blocking) and Jay Huff (floor spacer) bring something important to the floor. Managing psyches has been a large role for the coaching staff with the musical chairs at the center position. BG: Like you said, options are better than no options. Virginia has three active centers on the roster that all bring something to the table. Obviously, Salt has tremendous equity in the locker room, but Huff’s value as a space 5 can’t be understated. Nearly 90 percent of his field goal attempts are at the rim (80.8 FG%) or of the 3-point variety, which is awesome. At 7-foot-1, he can also attack a closeout; that’s notable for teams that try to run him off the 3-point line. I’m not sure if he will have a signature game to showcase that in the tournament, but it feels like he may have to — on some level. Huff draws gravity to the 3-point arc (46.7 3P%) or on basket rolls (69.2 FG%, per Synergy). His ability to change the dimensions of Virginia’s half-court offense, and let Bennett play five-out, is significant and could be something that swings a game for UVA. 2a. Let’s just say, hypothetically, Virginia is in a tight game — tied, with two minutes to play, and a trip to the Final Four on the line — which guy would you most rather have on the floor: Salt, Diakite or Huff? SP: It’s obviously a very matchup-based question, but in a vacuum I think the answer is Diakite. Mamadi’s raw athleticism allows him to impact a game in more ways than Salt or Huff can, when he’s zeroed in: 3.7 blocks per 40 minutes in ACC play. To me, that should win out when you have to bite hard and trust one of these guys with two minutes to play in a tight game. That said, Diakite can lose focus at time, especially offensively. If I had to guess, I’d say that Bennett has the toughest time trusting him over long stretches, so the decision on key minutes at center will be fascinating to watch as the season winds down. BG: This is something you and I have discussed since the start of the season. It’s true, too: matchups will likely dictate the personnel. For my money, though, it’s Diakite as well. Salt means so much to this program, and he’s a master of verticality on defense as he ferociously protects the rim. But for all of his expert-level screen setting, he’s a guy defenses can pay less attention, especially in leverage minutes. When he shares the floor with Kihei Clark, things can get congested at times for Virginia’s high-flyers, like Ty Jerome. Huff adds tremendous value on the offensive end (68.4 eFG%) and rim protection on defense — with a 10.3 percent block rate. The issues, of course, come more with him defending in space, which can arise with Virginia’s hard hedges on ball screens. In the win over Gardner-Webber, Virginia’s less aggressive ball-screen adjustments started with Huff and a more-conservative strategy. For UVA, the middle-road approach is Diakite, who have can a big two-way impact. Diakite can really run in space, protect the hoop (9.4 percent block rate) and finish with authority. This season, the junior center shot just under 74 percent at the rim and scored 1.54 points per possession on basket rolls — tops in the ACC (minimum 20 possessions). I also think the combination of Diakite and Huff is intriguing, too. That’s the duo UVA used to shred Syracuse with in early March. Play the twin towers together with Jerome, Guy and Hunter, and all of a sudden you become huge — but maintain the ability to space the floor with four 40-percent 3-point gunners. 3. Should UVA fans be at all concerned with Kyle Guy? SP: I don’t think so. Guy’s had an incredible season — and for a player that attempts as many closely-contested triples as he does — a very efficient one as well (45 3P% in ACC play). Guy had good looks against Oklahoma, but didn’t see one go down. Just like any other high-volume 3-point shooter (7.2 3PA per game), Guy has a tendency to go through stretches where he runs hot and cold. I think the rest of the field should be concerned that he hasn’t seen the ball drop yet in this tournament, because when he does, well, sorry for y’all. I feel the same way about Kyle Guy. At this point, who are we to worry about his shooting? Dude is going on his third year as one of the best off-ball shooters in ACC Basketball history: 241 career 3-pointers (43.1 3P%). According to Synergy, Guy posted a ridiculous effective shooting rate of 62.2 percent on half-court catch-and-shoot attempts this season. Considering the volume (226 FGA), that’s stunning, and reason enough to not let a small, two-game sample cause too much worry. He never stops moving — 57.6 effective shooting off screens this season, per Synergy — and the gravity he draws is a powerful force for Virginia’s offense. Even if he goes cold, teams still have to their defenses to deny and closeout of Guy 3-pointers. There’s value in that, too. We should also remember: it’s been just two weeks since Guy was breathing fire down in Charlotte: 9-of-15 on catch-and-shoot 3-point attempts at the ACC Tournament. I’m with you, Spencer. I think he’s due for a big game, too. 4. What are your thoughts on De’Andre Hunter’s role in Virginia’s offense? He’s second on the team in usage (23.4 percent), and he gets touches in good spots. But should UVA try to feature him even more prominently? If so, any ideas? The greatest offensive asset with Hunter is that he can play from just about anywhere on the floor (44.6 3P%, 69.5 FG% at the rim) and still be effective. As the tournament wears on and the teams get bigger and more athletic (*cough* Oregon *cough*), Virginia will have to be much more weary of matchups. This is where Hunter can become a Swiss army knife offensively. I love when the ‘Hoos empty one side of the floor and run a middle ball-screen with Clark and Hunter — it’s the best way to play through him due to the fact that it forces a defensive rotation. Virginia can get to some of these quality looks with off-ball actions, too. Obviously, Hunter can face and size-up the defender, jab step and stick a jumper. This is his go-to series of moves. When Virginia is able to get the defensive switch in the Clark-Hunter pick-and-roll is when things gets very complicated for opponents, and when Hunter is virtually unstoppable. The more Hunter gets to the rim for the remainder of this tournament, the better off Virginia is — plain and simple. In the above clip, Hunter catches against the smaller Justin Robinson, faces, quickly spins baseline and beats the help defender to the rim. No wasted motion. Meanwhile, Diakite is screening the weak side for open shooters, so Hunter has options. When push comes to shove against stronger and faster defenses, the ‘Hoos are going to be forced to play through Hunter. I’ve written about this all year: Hunter’s offensive versatility and efficiency is really special. He scores from all three levels (64.6 eFG% on catch-and-shoots), regardless of his defender, and he does so without too many mistakes (11.4 percent turnover rate). Overall in the half court, Hunter has scored 1.28 points per possession on non-post-up finishes at the rim, per Synergy. 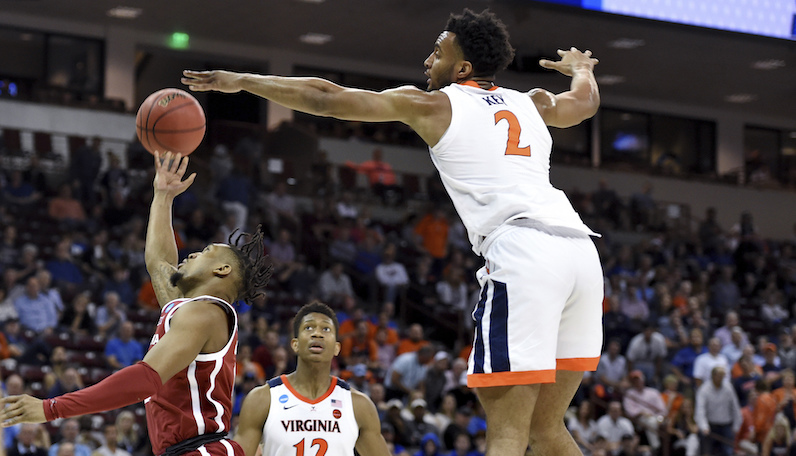 Hunter is never in a rush; he plays with great tempo and poise, which should be a boon for UVA in a pressure-packed tournament game. There are some who knock Hunter for a lack of explosion; however, I really don’t see that as too big of a deal. He still gets to his spots, plays with enough pop and finishes efficiently. Virginia’s offensive evolution this season has centered on that flowy ball-screen approach (CBS); Hunter gets involved in every component of this offense, including as a pick-and-roll ball handler. However, as Virginia has moved further away from its constant mover-blocker offense, Hunter’s isolation game, especially in the middle of the floor, is another key point of differentiation. Those looks can easily come out of live ball-screen action, too. And of course, you never have to worry about Hunter’s defensive capabilities on the other end of the floor, either. 5. What about Oregon worries you the most? SP: If you’re looking for quality Oregon Ducks analysis, I’m not your guy. But look, it’s pretty clear at this stage that Oregon is that one team we see every year that starts playing their best at exactly the right time. The Ducks are connected on the defensive end, and over the last four weeks, Oregon has rebounded the heck out of the basketball, too. It’s no secret that you have to make shots over the top of Virginia’s defense to beat them and Oregon has seen those go in a lot recently, so that’s my main concern. That said, I like the ‘Hoos big in this matchup. BG: Oregon, according to KenPom’s adjusted efficiency margin (now 27th), is the weakest team remaining in the NCAA Tournament field. For me, this team’s athleticism (top 20 in both block rate and steal rate), which is championed by high-flying big man Kenny Wooten, is scary. The Ducks rank 15th nationally in terms of average height, and while not a great rebounding team this season, Oregon can make life miserable at the rim. Along with Zion Williamson and Gonzaga’s Brandon Clarke, the 6-foot-9 Wooten (47 dunks) is one of the most nuclear athletes in college hoops. Wooten’s blocked 3.7 shots per 40 minutes this season — nearly 13 percent of opponent field goal attempts. In the win over Wisconsin, Wooten blocked four shots; as a team, Oregon rejected nearly 17 percent of Wisconsin’s field goal attempts. The Badgers posted a hapless effective shooting rate of just 38.3 percent. Two days later against UC Irvine, Wooten threw down five dunks while blocking seven more shots. Huff could be key here — in an effort to move Wooten away from the hoop.